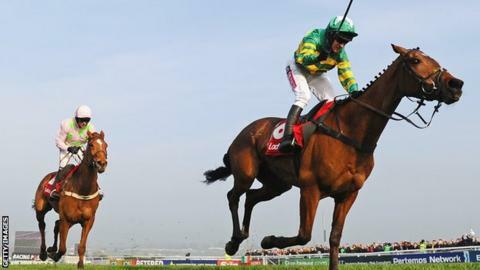 Last year's winner More of That and runner-up Annie Power are among the 36 entries for the World Hurdle at the Cheltenham Festival in March. The Jonjo O'Neill-trained seven-year-old beat his Irish rival by a length and a half last March. But he surrendered his unbeaten record when third to Medinasin in the Long Distance Hurdle at Newbury in November and subsequently had a wind operation. The race over three miles takes place on Thursday 12 March. Annie Power, who has not run this season after a setback in November, is one of eight entries for Willie Mullins, while the 17 Irish-trained entries also feature Lieutenant Colonel for Sandra Hughes and Monksland from the Noel Meade yard. Zakander is one of two entries for Paul Nicholls while hopes are also high for Harry Fry's Rock on Ruby and the Nicky Henderson trio of Beat That, Whisper and Blue Fashion.